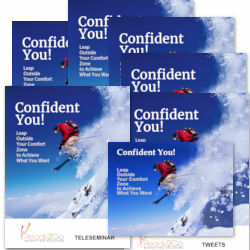 Special Report: Transitions and Transformations - Thriving in the Midst of Change from Ready2Go Marketing Solutions, Inc.
Confidence is the quality that every self-conscious person in the world wants to possess. It is the oil that greases the wheels of success. 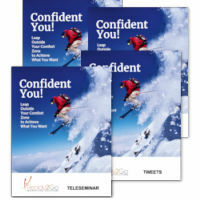 Confidence is the self-belief that strengthens our resolve, boosts our courage, and reduces our anxieties and fears. Confidence gives you hope that you can accomplish your heart's desires! And the truth is that in today’s world our confidence may be taking more hits than ever before. We work hard and then someone else gets the promotion. We play by the rules and find ourselves out of work. We make what we believe are smart decisions, only to find ourselves in an unsure circumstance. It would be easy to throw our hands up in the air and yell, “I give up!” But we won’t. That’s because we know we are ultimately responsible for our lives. 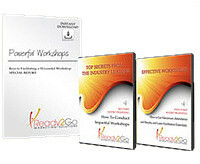 This special report is for people who want to increase their confidence, move forward with hope, and arm themselves with the necessary tools to live a fulfilled life.